I applied and was accepted to complete a one month residency and exhibition in a forest in Shovenhorst. Trees from all over the world had been gathered and planted very unlike our Canadian Forests. I chose to work alongside fellow Artist, Kiki Van Der Heiden also from Queen Charlotte in a small cedar forest. I plaited cedar bark from here after freezing it to make sure no bugs were present placed it in a small area under the outside bark of a young cedar. 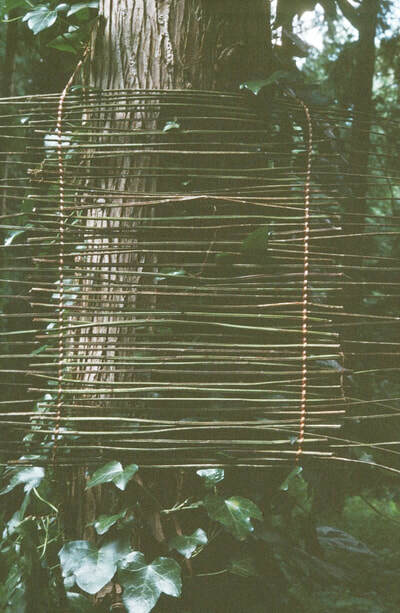 ​The other work I embarked on was building a Skyladder with stinging nettles installed up the side of tree. I had many conversations with Elders about how the nettles were made in cloth during the war and used to make uniforms.